When the Okanagan comes to mind, many people think of sun-drenched vineyards, warm sandy beaches, and farm-fresh produce. What more and more people are learning is that in the heart of the region lies Penticton, one of BC’s best craft beer towns. With five craft breweries and two more opening in 2019, come see for yourself why Expedia.ca recently named Penticton as Canada’s second best beer town. This fabulous four-season playground has become such a popular destination that askmen.com recently named Penticton as the only Canadian city on the list of “10 best destinations for beer enthusiasts”. All the craft breweries in Penticton are within a few minutes of each other, so you can easily visit them all. Pick up a Penticton Ale Trail passport at any of the breweries, and get it stamped at each one for your chance in the quarterly draw for a Penticton Ale Trail prize package. We are stoked to be welcoming two new breweries in Penticton. 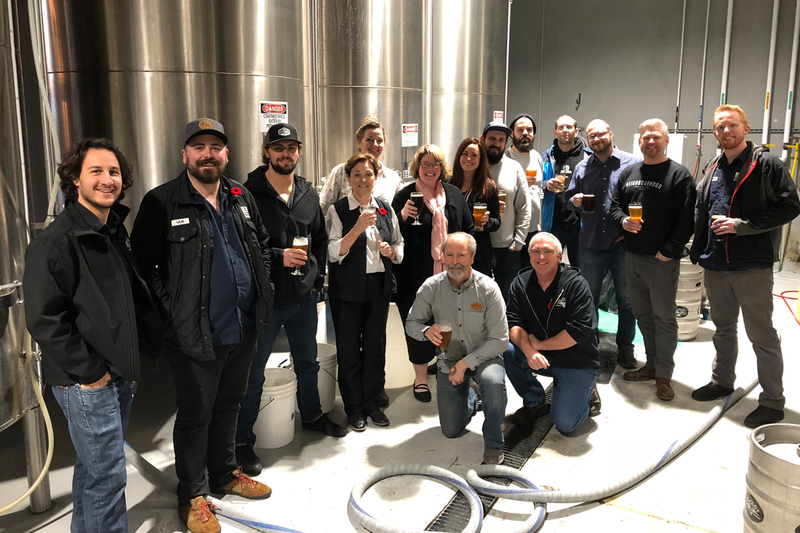 Plans for both Hatchery Brewing and Neighbourhood Brewing are well underway, and both teams hope to have beer flowing in their new digs by the summer of 2019. From Penticton, head south to Oliver to visit Firehall Brewing. Or head north to Summerland to visit Detonate Brewing and another start up, Breakaway Brewing, aiming to open in the summer of 2019 in downtown Summerland. A great reason to head to the Okanagan this winter is for Brewski on February 16. Brewski is a super cool craft beer, spirits and cider festival held at The Gunbarrel Saloon at Apex Mountain. This signature event sells out in days, so watch for tickets to go on sale in December. Your Brewski ticket also gives you a discount on lift passes. There is nothing better than hitting the slopes during the day, and then enjoying craft beverages, appies, and live entertainment in the evening. Also, save the date for the 24th annual Okanagan Fest of Ale coming up on April 12 and 13 in Penticton. Early bird tickets are on sale until January 15. There are some great Sip & Stay ticket and accommodation packages, so plan to join us in Penticton at this festival for a full weekend of great craft beer and cider. Our local breweries have some great new beers in the works for winter. Bad Tattoo is launching a barrel-aged IPA called Wyld Creatures Mango IPA in December and a Black Ink Russian Imperial Stout in January. Both will be on tap at the brewery and available in 650 mL bombers at select stores around BC. The Barley Mill’s new Rude Pony Black Lager will be exclusively available on tap and for growler fills. Cannery Brewing will be launching popular winter seasonals Darkling Oatmeal Stout and Heist Maple Stout, both in 473 mL cans, this year. Also, watch for the first ever barrel-aged beer from Cannery. The Berry Kettle Sour was aged in Chardonnay and Viognier barrels from Elephant Island Winery. It will be in 750 mL bottles at the brewery and at craft beer stores around BC in time for Christmas. Highway 97 Brewing has two new beers for the winter. Fresh Tracks Winter Cream Ale is a true West Coast cream ale, and Bumbleberry Pie Saison is a Belgian fruit style saison. Watch for both in 473 mL cans at cold beer stores and the brewery. You can also enjoy it on tap at the brewery alongside one of their new gourmet grilled cheese sandwiches. Tin Whistle will also be launching two new beers this winter: Twisted Pink Guava Hazy Pale Ale and Wasted Grape Saison, which is aged on Gewürztraminer must and was made in collaboration with Wild Goose Vineyards. The popular Chocolate Cherry Porter will also be back in time for Christmas. These beers will be available in 650 mL bombers and on tap. Further south in Oliver, Firehall will be releasing their Bourbon Barrel Stout, which was aged for 18 months, this winter. It will be available at their Beer Shop & Social, along with their holiday mixed cases. You can pick some up when you visit them for their annual Great White North concert on December 22.